The Lelani is a medium sized free form fiberglass pool with a shallow end tanning ledge. It fits conveniently in small to medium sized backyards, due to its overall length of only 23′ 9″. This swimming pool is perfect for a small to medium sized family that wants a great place to respire from life’s hustle and bustle. If your on the market for a fiberglass swimming pool, but need something that’s a little more petite, the Lelani is a great contender! 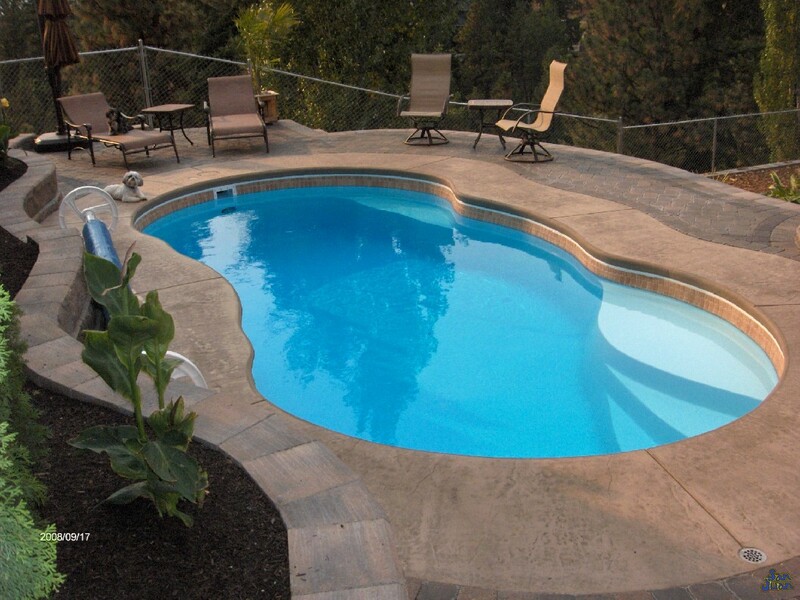 This beautiful free form swimming pool is designed for small to medium sized backyards. 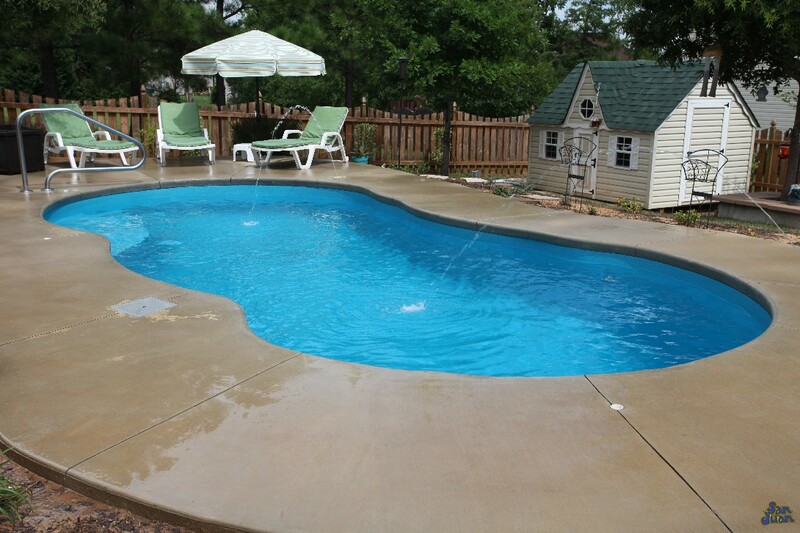 It’s overall water volume of 6,000 Gallons makes it exceptionally easy to maintain, chemically. 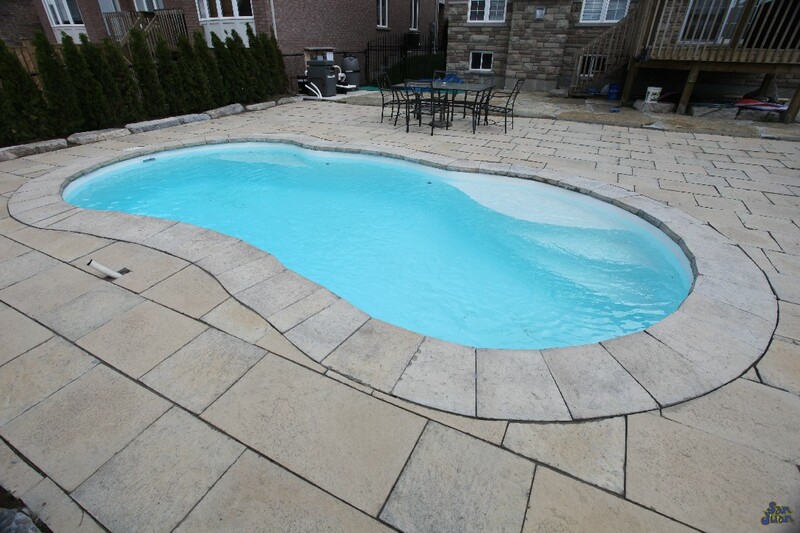 Secondly, its free form design provides us with ample opportunity to fit in some great pool features. The Lelani sports a shallow end set of entry steps plus an elongated top step. This is commonly used as a tanning ledge and a great spot for pets and young children to sit. 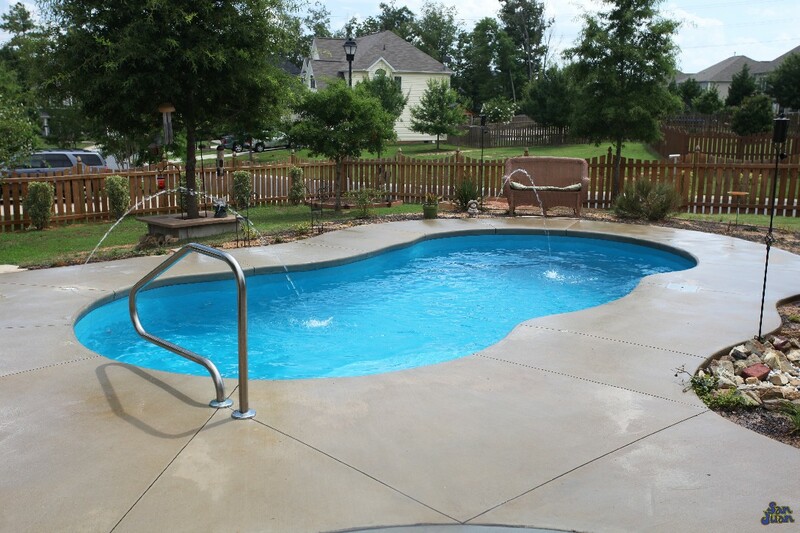 Casting out into the deep end, we provide you with a total depth of 5′ 11″ plus a deep end swim out bench. Despite it’s petite length of only 23′ 9″, the Lelani has a lot to offer. It quickly transitions from a shallow end into a deep end in a relatively small space. Therefore, this swimming pool is likely a great option for intermediate swimmers. As indicated above, the Lelani is a great addition to any small to medium sized backyards. It fits snugly in spaces where our larger models would not. Secondly, it’s a great option for households that want to save on the cost of their swimming pool. 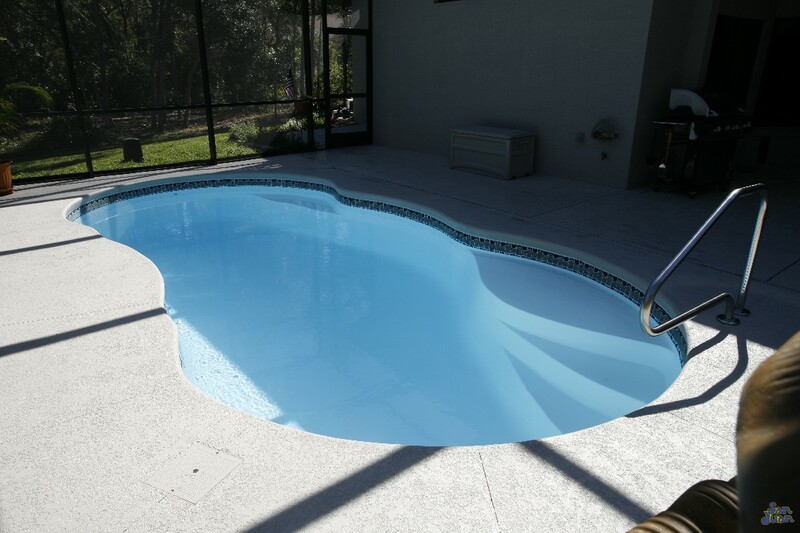 This is a great entry level swimming pool for first time pool owners and we couldn’t recommend it more! If you’re part of the working world, then you need a space to escape from the hustle and bustle. The Lelani is a great oasis to help you find the rest and relaxation you need to recharge your batteries. 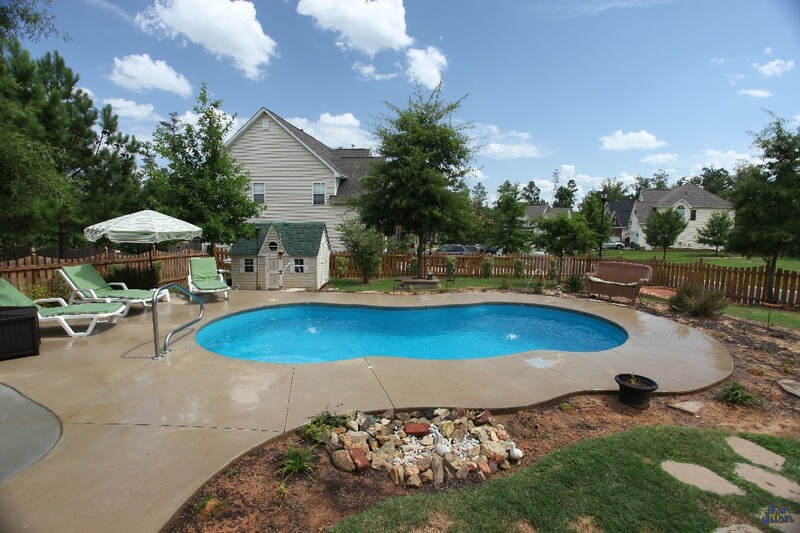 Dress it up with some convenient pool furniture such as a table and umbrella for a well rounded outdoor living space. The concept here is creating an outdoor living space. This is a strong trend in our industry and we are big believers that people should be spending more time outdoors. What better way to tap into your natural environment than relaxing in the crystal blue waters of the Lelani? Bringing it all together, we recommend the Lelani to a home owner who is working with a small space or economy budget. It’s a great swimming pool for recreational swimming and reconnecting to the great outdoors. The free form shape provides a very attractive design aspect to any backyard and. Lastly, it’s minimal size of only 6,000 gallons makes it extremely easy to maintain, hence more time to enjoy!